Lamp guest house is very warm atomosphered family running tiny hotel in Sultanahmet area in istanbul. As the name of the hotel, We are welcomed all of the guests with the a lot of beautiful lamps at the entrance. 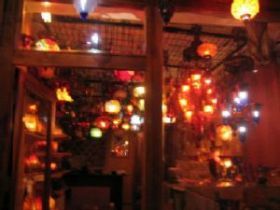 We have very clean, and charming rooms decorated the beautiful lamps. Rooms are absolutely different each other, we have Dormitory, Single room, Doble rooms, Delux wide twin room(all room included the breakfast). The room prices are reasonable . so all kind of tourists , from one person to the group & family, can enjoy staying here. Also you can enjoy the breakfast on the terrace of our hotel with view of the beautiful blue mosque and Marmara Sea every morning. If you are lucky, you can see the group of dolphnes swiming around Marmara Sea. And Especially the night view from our terrace is marvelous and romantic. You can see the Blue Mosque with light up and the Marmara Sea shining on the moonlight. We really want you to see these beautiful view from our terrace. And You can use the FREE INTERNET for 24 hours on the terrace. 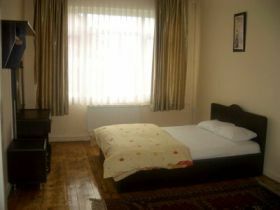 We can offer a varietiy of rooms from dormitory to delux wide twin rooms are very charming, cozy, and pleasent. 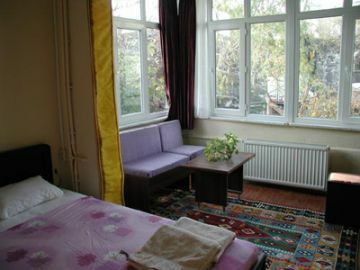 We also can offer the rooms with the beautiful view of Blue Mosque from the window. And all rooms have a big bed with private bathroom and included the breakfast on the terrace. 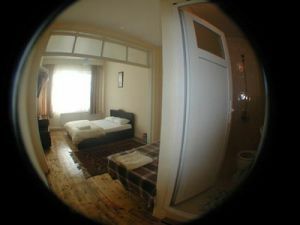 Lamp guest house is located in Sultanahmet, the center of old city of istanbul. Our hotel is located very closed to the Blue Mosque. And you can go easily Haiga Sophia, Topkapi Palace, Underground, Grand Bazzar and a lot of famous sightseeing places by walk. And you can find a lot of wonderful restaurants, cafes, bars, shops for gifts and everything around here. 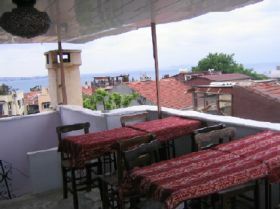 Lamp guesthouse is located in Sultanahmet, the center of old city of istanbul. hotel is located very closed to the Blue Mosque. From Sultanahmet station, go toward Blue Mosque and go through Arasta Bazaar and you can get to the Akbiyik Street which our hotel is located. from Ataturk Internatinal Airport by train, get in the metro from Airport to Aksaray station, And then transit to tramvay from Laleli to Sultanahmet. We also have pick up service if the guest needs. Also We offer the private pick up service as 20 Euro per one car(from 1 to 4 person available). We are waiting for the guests at the arrival gate of the airport with the name board. If you need these service, please let us know in advance.